I’m on the plane home from Toronto. 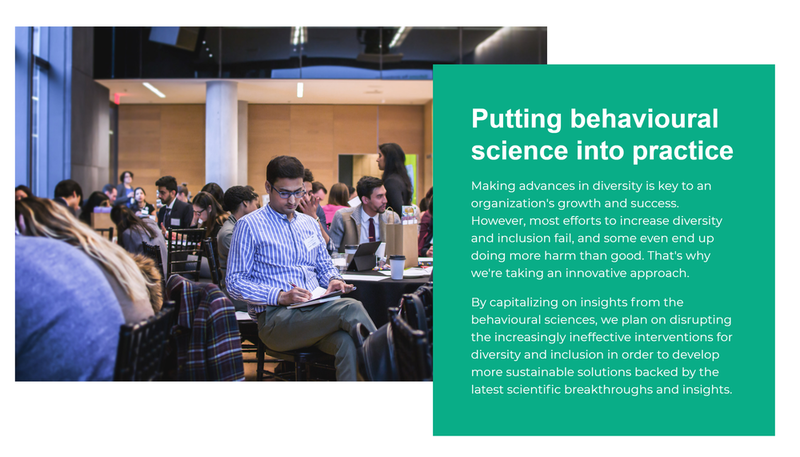 I’d travelled for Rotman School of Management’s BAD conference: a collaboration between two leading research centres: Gender and The Economy (GATE) and Behavioural Economics in Action (BEAR). It’s been an inspiring trip. I’ve had the honour of hearing from the field’s best and brightest. This article is for those who were interested from a distance - those who care about inclusion and are curious about what a behavioural approach can offer. What is a behavioural approach? “We need to move away from changing minds to changing behaviour”. Director, Institute for Gender and the Economy. Distinguished Professor of Gender & the Economy. It’s a plea underpinned by a cold, hard reality. You can train a person to be inclusive but it’s unlikely to change their behaviour. And if you convince someone that ‘diversity’ is in their interests with a business case, it doesn’t mean they’re going to carry a ‘new mindset’ around with them in the world. This way of thinking is intuitive but it is also flawed and ineffective. Regardless of your attitude to road safety, the environment around you is designed to promote safe behaviour. Yes, it’s illegal to drive dangerously, so the consequences are real. But you are also nudged repeatedly, especially during moments of high risk. Black and white arrows highlight sharp turns, schools are clearly signaled, chevrons encourage you to keep your distance from the car in front, and smiley faces and bright yellow cameras discourage you from going over the speed limit. Each intervention responds to a specific problem and works in the instance that problem occurs - exactly how a behavioural scientist thinks about inclusion. We focus on the moment a recruiter is screening a CV or assessing a candidate; the moment a manager sits down to appraise an employee; the moment a leader chooses to listen, promote or allocate work to a team member. In each, and many more besides, we seek evidence of bias or disadvantage and use a scientific understanding of the human mind to intervene. Not by changing mindsets, but by redesigning the world we live in… the moment the problem occurs. ﻿This requires US TO think differently about inclusion. A behavioural approach to diversity thinks small, like a skilled forester. Both know that one swing of the axe, however powerful, can’t match the compound effect of precise, deliberate, iterative strokes. Over the course of the conference, we heard from researchers who have spent decades honing their craft. “Gender stereotypes are the frame for our social interactions. They are the context for our behaviour. They’re not always salient but they are there, waiting to pounce… Given these stereotypes, we can encourage women to lean-in to agentic behaviours, like aggression, ambition, confidence and arrogance. But we could also reduce their value in our organisations, with less hierarchy and more cooperation by design”. “If we are not actively dismantling these structures we are upholding them… We need leadership that is about highlighting the gaps even if you don’t know what to do about it. Because the expertise exists. EVERYONE CAN CONTRIBUTE TO A BEHAVIOURAL APPROACH TO DIVERSITY. In my view, a traditional approach to diversity asks HR and D&I leaders to know everything and do everything. They gain the buy-in and create the space for change, they design and deliver the initiatives, and they measure and report on progress. As someone sitting nearby me mentioned during the break - ‘nothing ever seems enough’. The behavioural practitioner is a follower. For every area of inclusion, there are experts who have conducted and compiled decades of research with laser-like precision. The behavioural practioner is proud to seek them out, follow their thinking and translate their insights into practical interventions. The behavioural practitioner is a curator. The skills required to deliver a behavioural approach are diverse and technical. The behavioural practitioner curates data scientists, behavioural scientists, designers, communicators and domain experts in talent, performance, recruitment etc. They bring together the perfect team for the problem at hand. The behavioural practitioner thinks big, works small and redefines failure. Inclusion is not solvable in one fell swoop. So, a behavioural practitioner focuses on precise issues, trusts others will do the same and understands that systematic change is a team game. Failure, through this lens, is not getting things wrong or aiming too small. It's not exploring, not experimenting and not learning and sharing something new. Start there and see what happens. And if you’re here in the UK, come and talk to us. We’re working with some of the largest private and public sector employers to apply these insights and we’ll be here to support if you need us. I’ve not included everyone who spoke at the conference in this summary. The day was co-led by Professor Sonia Kang. There were two great speakers from Bank of Amercia (Jackie VanderBrug) and Walmart (Kathleen McLaughlin), as well as two outstanding panels on masculinity and change, featuring Professor Dolly Chugh, Professor Katy Milkman, Eric Singler, Maydianne Andrade, Humberto Carolo, Professor Jamil Javani, Professor CJ Pascoe and Professor Nouman Ashraf. All raised many more insights, that I will get to on another day and after a bit more sleep! Gender Stereoptypes with Professor Alice Eagly.